One-third of workers in Argentina are not registered with the authorities, a staggeringly high figure that has remained consistent for decades. With the government seeking to advance key tax and labour reform packages after October’s midterms, journalist Fermín Koop asks the experts what can be done to tackle a problem that disproportionately affects low-skilled, low-income workers. As many as one-third of people nationwide are informal workers, official statistics show. Foto:Cedoc. When looking for a job in Argentina, there are always issues to resolve. It’s not only about getting a decent paycheque at the end of the month. Or about how much of your health plan is covered. For many workers, the most important question is whether your employer will officially register you as their employee and at least a third of people nationwide find out that will not be the case. It’s a figure that remained stable; no government has really been been to lower it over the past decades. The labour situation becomes an even larger problem if selfemployed workers, co-op members, family workers and owners of informal sector companies are considered as unregistered workers too – a change which should be made immediately according to the International Labour Organisation (ILO). If it were so, the label would apply to 46.8 percent of workers in Argentina. “We’ve reached a point where the only way to solve the problem is through major changes. It’s an issue which keeps coming up, no matter what kind of government or economic scenario we have,” said Javier Lindenboim, an economist specialised in labour and the head of the UBA Buenos Aires University’s Employment, Population and Development Centre (CEPED). It seems the Mauricio Macri administration is preparing to do just that. With the problem ongoing and the need to find sol u t i o n s paramount, the government is seeking to discuss both labour and tax reform packages in Congress after the midterm elections. Experts and economists believe some of the necessary changes may be ahead, but will the government truly be able to tackle a problem which is both longterm and has affected all of Argentina’s governments? Five million. Being an ‘informal’ or ‘unregistered’ worker means working under precarious conditions, with no health coverage and no pension or retirement plan. There are about 15 million active workers nationwide, nine million of whom are registered in the public and private sectors. An estimated five million workers are unregistered, according to figures from the INDEC statistics bureau. Another four million in Argentina are self-employed. Unregistered work often means significantly lower wages. On average, informal workers earn 6,900 pesos monthly, some 55 percent less than the 15,500 received on average by registered workers. 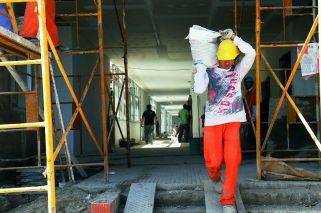 Almost 50 percent of informal workers are paid about 6,000 pesos and 27 percent receive as low as 3,600 pesos. This is mainly because they are less skilled, work fewer hours and because collective-bargaining wage increases aren’t respected by employers. 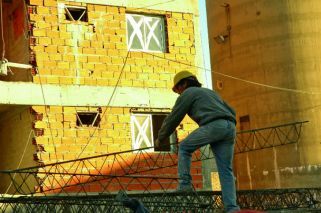 Santiago del Estero is the province with the highest rate of unregistered workers, reaching 51.6 percent of the population there, according to INDEC data. On a regional scale, the northwest (NOA) ranks highest with a rate of 40.7 percent. In Buenos Aires City, 24.2 percent of the active workers are not registered, which equates to around 300,000 people, while in more populous Greater Buenos Aires the number jumps to 36 percent. Drilling down into the numbers, some clear trends begin to emerge. Women are more likely to be informal workers than men, as are young workers of up to 24 years old, 60 percent of whom aren’t registered officially. As a person’s level of education rises, the rate of unregistered workers drops. Construction, agriculture and domestic help are the sectors in which unregistered workers are most common, with up to 50 percent of informal work, followed by community and social services and retail. Generally, as the size of a company increases, the number of unregistered workers drop, recent data shows. Companies with more than 40 employees have an average of eight percent of staff as informal workers, while those with less than five employees normally over 60 percent of those members of staff unregistered. But as we’ve seen, this problem is not a new occurrence. So how can the issue will tackled definitively? Dante Sica, the head of the Abeceb consultancy firm, said a “wider perspective” is needed, considering Argentina’s decades-long history of a high informal working rate. “The cost of having a registered worker has to be the same as having an unregistered one. This has to be the objective, even [if it means] sanctioning those who hire informal workers,” he added. “We have a closed economy with a low rate of investment and a slow dynamic of formal job creation. The tax burden is high and that encourages informal employment, as companies choose it to be more competitive. It’s not just a problem of the labour market, it has to be addressed through many areas,” Sica said. Long-term. Informal work shouldn’t be considered a temporary or specific problem, it’s much more general and has been going on for a long time, with that figure of one out of every three workers being unregistered remaining consistent over recent decades. Digging into recent history, the first years after the return to democracy saw the lowest rate of unregistered workers. 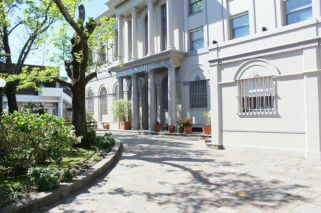 In 1985 – the first year with available data from the INDEC statistics bureau – the percentage stood at 25 percent in the Greater Buenos Aires area. When former president Raúl Alfonsín left office in 1989, the rate had climbed to 32 percent. The rate started to grow again during the 1990s and rose sharply as the 2001 political, social and economic crisis took hold. When former president Fernando de la Rúa left office in December 2001, the rate of informal workers had soared to 38 percent. In the early years of the new century, unemployment levels started to drop, but numbers of unregistered workers continued to rise, reaching the highest figure in history in the third quarter of 2003, when 49.5 percent of workers were informally employed. The beginning of late president Néstor Kirchner’s administration led to a long-term drop in unregistered workers between 2003 and 2012. Several policies were taken to tackle the problem, with the government introducing lower taxes and economic incentives for small- and medium-sized companies to encourage them to formalise workers’ employment, stricter labour inspections and sanctions for offending companies being placed on public record, measures which all formed part of the Registered Work Law. “Following the 2002 devaluation, the dynamic of the labour market helped to lower the pressure from the informal labour sector, lasting until a decade ago. Since then, policies have been almost nonexistent and consequently there haven’t been many changes in the rate,” Lindenboim said. Since 2012 the drop in the unregistered work rate has slowed, remaining above the 30-percent mark. Former president Cristina Fernández de Kirchner was unable to sustain the decline. President Macri hasn’t had better luck so far in his time in office, only pushing for two programmes which haven’t yet been implemented. Macri unveiled the “Empalme” programme, which allows private-sector businessmen to receive an economic incentive when hiring unemployed workers who are on welfare. The initiative was sanctioned via a presidential decree in May but hasn’t been fully rolled out. The government’s stated aim is to reach around 400,000 people in total and formalise their employment. Macri has also sent to Congress a bill to encourage companies to hire young workers between 18 and 24 years old by lowering taxes. However, the initiative never reached the Lower House floor and remains stuck at the committee stage awaiting discussion. The problem was recently acknowledged by Production Minister Francisco Cabrera. Speaking at an event, he said Argentina “can’t have such high current level of labour informality, with five million people working in the underground economy.” He admitted that the government “has to work” on the issue. Changes afoot. There are, however, changes in the pipeline. Recent sweeping labour reforms carried out by Brazil under the leadership of President Michel Temer has helped build momentum for the Macri administration to push the agenda toward broad labour and tax reforms in Argentina. Among the changes in the neighbouring country, Temer’s government established more flexible conditions for hiring and firing, widened the scope for job outsourcing and reduced the strength of unions. In Argentina, the government has started laying the ground for some of those changes too. Macri frequently speaks about a “mafia” behind labour lawsuits and the need to improve on current labour agreements to increase productivity, while the number of union interventions is on the rise as well as the number of social and work conflicts that have been seen off. The eviction of the Pepsico factory is one recent example. While not many details have been disclosed thus far, the government will push for a wide plan which would companies to pay their tax arrears as well as reducing social contributions on minimum wages, to encourage more workers to be hired and registered. At the same time, new internship and training schemes would be implemented and labour agreements would likely be updated. The recent agreement between the national government, unions and oil and gas companies to update the labour agreement to exploit the Vaca Muerta shale deposits is a good example of Macri’s path forward. Companies expect to lower costs by between 30 and 40 percent thanks to the agreement, which sets productivity goals, allows the relocation of workers and sanctions absenteeism. “We need to adapt our tax framework to the very high percentage of informal labour, in order to start reducing it. But just lowering taxes won’t do the trick. There’s no way of getting more registered workers if the economy doesn’t grow,” Carugati said. “We need to create quality jobs. Employers don’t want to have unregistered worObtaining good results in the October midterm elections would perhaps be the final push the government needs in order to move forward with the debate in Congress, reducing the possibility of opposition lawmakers and union leaders blocking such changes. In contrast, a tight victory or even a defeat would give the opposition the boost it needs to resist the Macri administration’s plans.